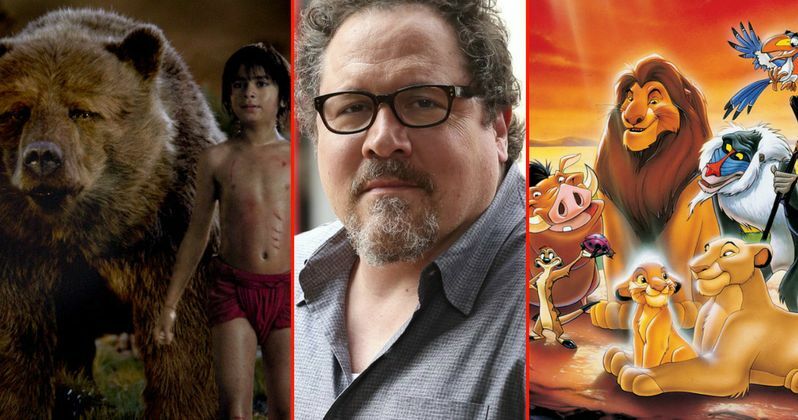 Back in September, we reported that director Jon Favreau, fresh off his box office blockbuster The Jungle Book, will return to Disney to direct their live-action adaptation of The Lion King. Jeff Nathanson came aboard last month to write the screenplay, and while no plot details have surfaced yet, Jon Favreau did recently reveal that he plans on using virtual reality technology while filming The Lion King. In another interview, the filmmaker also teased that he plans on shooting both The Lion King and The Jungle Book 2 back-to-back. Here's what he had to say about how the VR technology has changed over the years, and how he used some VR tech on Jungle Book, but plans to use a lot more in Lion King. "A lot of the simulcam and motion capture technology that we use here, a lot of it was innovated around the making of Avatar, and hasn't really changed much, because there's just not a lot of consumers. There are a lot of people who watch, but not a lot of people who use the technology. So we were finding ourselves building around technology that hadn't changed a lot in the last 10 years. But now as we're exploring what is being developed for VR, and game engine technology, a lot of that was used to some extent in Jungle Book, but as I look forward to developing this process further, there's a lot over overlap." During his interview with Coming Soon, the filmmaker revealed that he had first gotten into VR while working on a project called Gnomes and Goblins, where he began experimenting with how to design particular shots in VR. The filmmaker added that he plans to user VR to create a virtual environment and do a full scout with his crew. Here's what he had to say about how he plans to use virtual reality with The Lion King remake. "Being able to scout-and some of this we were doing with Jungle Book as well, but the ability to actually design an environment virtually, and then to walk around in it with your crew, doing a scout. And to be able set shots and to be able to choreograph movement, and move set pieces around before you do the heavy versions of it. Because there's a lot of really light files, again, the processing is getting better and the coding is very specific to game engines now, so that the files remain light, so you can experience them in real time, so you can move assets around in real time, and start to rough in what you want to do as a filmmaker. And finally, when you deliver it to the point where you're actually turning it over, and rendering the stuff in a very expensive, time-consuming way, you've already made all your creative decisions using technologies that are more geared towards gaming." If you want to look at things in real time, especially in 3D, the game engines offer you a lot of opportunities to build upon that engine." In another interview with Collider, the director admitted that he's not trying to "outdo" the original animated version of The Lion King, which also spawned a number of sequels and a hit Broadway musical. The director added that he wants to use the same "photorealism" techniques he used to bring the animals to life in The Jungle Book with The Lion King. Here's what the filmmaker had to say below. "The thing is that the animated version of The Lion King is - I don't know how you outdo that. It works tremendously well. I think it was sort of the end of the era before the 3D animation started coming in, and I don't think anybody wants to see an animated version because if you want to see an animated version, look at the original. It holds up, it's still wonderful to watch. So the trick is can you make it look like you actually found real animals in a real environment? And how do you translate the story through that? And in that sense, what we learned on Jungle Book as we got into the photorealism of the environments and the characters, the behavior of the animals, how do you use the lessons you learned there, but adjust it to the tone of what Lion King is? Because I think that when you hear the opening song, when you see those images, the photography of it, even in 2D it is arresting, and I try to imagine what it could be like using the tools that we have today and could we make audiences feel the same way and retell the same myth using these new tools? So the challenge becomes how do you have it look photoreal? And what has to be adjusted so that it doesn't feel inconsistent? In Jungle Book, if we just took everything that was in the '67 film, that humor would have been too broad for a live-action, and also you have to take into account that these look like real animals, so the intensity of it gets really notched up. So understanding the lessons that we learned from Jungle Book is really helpful as we develop this, but it's all a discovery process. And fortunately, working with a lot of the same people and it feels like a continuation of that journey." The filmmaker also revealed that he plans on filming both The Lion King and Jungle Book 2 back-to-back, a feat he is confident he can accomplish, since he has already done it before. The filmmaker directed Iron Man and Iron Man 2 back-to-back, which hit theaters in 2008 and 2010 respectively, but there are currently no release plans for The Lion King reboot or The Jungle Book 2 quite yet. Here's what the filmmaker had to say about shooting both movies back-to-back below. "I know from having worked on two superhero movies back to back, these take many, many, many years. I was working on Marvel movies for like four years back-to-back. It's a big chunk of your life and you have to make sure that you're excited and can bring all of your attention and concentration to bear on this, because they are really big puzzles. Every film is a puzzle you have to solve-these highly technical ones are like 3D chess." Disney confirmed in April that one of the five new release dates it set between 2017 and 2019 is being reserved for Jungle Book 2, with the August 3, 2018 or November 3, 2018 dates reportedly being eyed for this sequel. Still, it remains to be seen when production will begin, with Justin Marks returning to write the script. Here's what the director had to say about his approach to the sequel. "For Jungle Book 2, it's all about the story, all about the script, all about the characters and we're working on that, and making a lot of progress and have some stuff that feels connected. Because you want it to feel like the first film. You want it to feel not like you're doing a different genre film because you're doing another chapter, you want it to feel connected to the original." It remains to be seen when Disney will announce official release dates for either of these highly-anticipated projects. The studio hasn't revealed which one will go into production first, but we'll have to wait and see. Hopefully Jon Favreau will shed some more light on both of these projects in the near future.